Westport has been awash in 50-year celebrations. Mitchells, Staples soccer, Staples Players, Orphenians — all reached the half-century mark within the past year. The Inn at Longshore back in the day. Much has changed since this undated photo was taken -- and much has not. Few Westporters realize that our town jewel camethisclose to being something else entirely. In early 1960, the 169-acre property — the privately owned Longshore Beach and Country Club, with a golf course, tennis courts, pools, marina, inn/restaurant and play areas — came up for sale. The typical Westport response — build houses! — was strongly considered. But First Selectman Herb Baldwin and his kitchen cabinet decided to make a bid, on behalf of the town. Longshore is a photographer's delight, at all hours of the day and in every season of the year. To mark the occasion, First Selectman Gordon Joseloff has appointed a 50th anniversary committee. We (full disclosure: I’m on it) will celebrate the milestone appropriately — through public ceremonies, exhibits, a website and publications. We have started collecting materials, and despite the early stage we can tell it’s going to be a very cool project. At the 1st meeting, we saw memorabilia ranging from towels from the old private country club, to 1920s aerial photos showing just a rough 3-hole golf course near the Inn. Westporters will learn much about Longshore over the coming year. It looks like the celebration will culminate with a grand event on May 28, 2011, honoring the end of the public park’s golden anniversary. “06880” will report back, from time to time, on Longshore’s 50th. Meanwhile, the next time you drive past the park — or into it — look around. Enjoy the spectacular view. And think what this town would be like if — 50 years ago this winter — our civic leaders had decided that $1.9 million was just too much to pay for 169 acres of land. 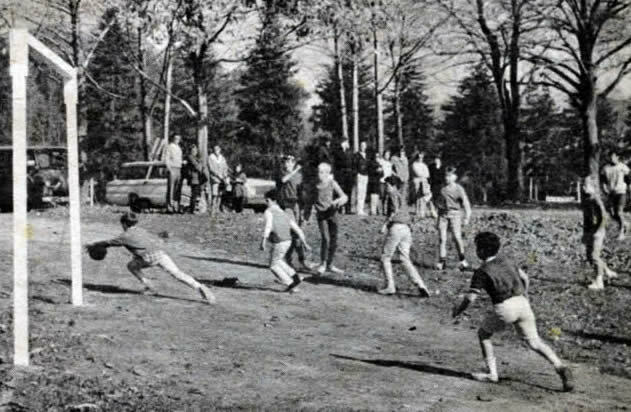 In the mid-1960s, the Westport Recreation Commission's youth soccer program played games at Longshore. The field -- now the site of the Inn parking lot, and several tennis courts -- sloped appreciably upward. This shot looks toward the golf course; the Inn would be on the left. This entry was posted in History, Local politics, Longshore, Places and tagged Gordon Joseloff, Herb Baldwin, Longshore, Longshore Club Park, Longshore Sailing School, the Inn at Longshore. Bookmark the permalink. Here Dan is a only in Westport and at Longshore story….. My older brother Mike and my neighbor Buddy Wilkenson are about 13 or so and going out to play a round of golf. Like any twosome, they got paired up to make a foursome. The pair they were teamed up with was no other than Mrs. Bing Crosby and here assistant. She was at the playhouse and wanted to play before a show. Only in our town at our own Country Club. I am looking forward to hearing more about the history of this gem. And I do get the reference to Hall and Oates. I was one of those “in-the-know” who was Longshore, waiting with great expectations. Interesting that there is a Longshore committee. 50 years ago my family and I were relatively new Westport residents. 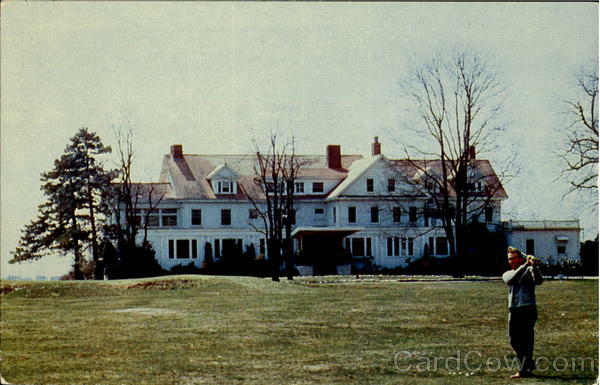 My father had us live for a while at the Knoll House at Longshore(between tee 2 and 3) before we moved to Bluewater Hill in 1959. He was a NYC developer and he became friends with the owners of Longshore. It was he who got them going on selling the property, and he was going to purchase it for development. My mother was opposed to taking what she considered a virtual park and chopping it up, so she became very active on getting the town to agree with those who wanted to purchase it. As you know Ralph Sheffer is the one who arranged for Westport to buy the land. However, I believe there was either a referendum or possibly in those days even an actual Town Meeting where the purchase was approved. It was contentions as I recall…but hey, I was only 12 then so memory is a but vague. It was an interesting process which polorized the town, and I recall one radio broadcast where some of the old Westporters took to task the free spending of the recent move-ins like my parents friends who are now all the old guard… if they are still alive. I seem to recall a Mrs Ceney actually yelling about how her taxes could go up as much as $100 a year if we bought a waste of space, and my mother working out a plan to grandfather in long time Westporters and those with less deposable income so they would not be taxed to buy the place. One of the funny stories the seller told my dad about the purchase was that the town calculated their offer based upon a survey of Longshore’s land acreage, and the water area was to be thrown in for free (back in the day no one cared to live on the water; go figure). However, the survey reported on the land at low tide and so all of the marsh land was included in the calculations for available acreage. Plus ca change……. Dan – I was just old enough to remember hearing rumors and whispers that Hall & Oates was going to make a “surprise” appearance at Longshore (I was going to Beach School at the time and we spent 2 days a week at Longshore) – which was a huge deal since they were one of the biggest groups in the US – but that it never happened (or was never going to happen). So, was it a hoax or not? Or will I have to wait for the book? The woman who had “booked” the show kept saying they were delayed — stuck in traffic — on their way. Finally, it was obvious they were not coming. Staples student Cary Pierce got up and performed, and everyone had a good time. Anyone with other memories, feel free to chime in. I vaguely remember my late mother as being one of the naysayers: “We have Compo Beach, isn’t that enough!!! !” She knew from nothing. I have lived all across the country and whenever people I meet discuss Westport they always mention the crown jewel: Longshore. When Pitney Bowes was recruiting my wife to come to Stamford (before me) they used the availability of Longshore as a selling point. The best deal since Manhattan was bought for wampum!!! 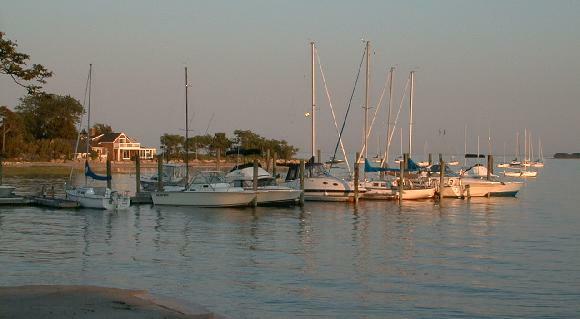 In 1960, the purchase of Longshore also helped shape the community. In becoming a public facility, Longshore was a country club without restrictions based on income, race or religion. Anyone who could pay the minimal fees could join. I remember my father pointing that out as we drove down the tree-lined drive on the way to the pool. I’m going to pat myself on the back for a moment – anyone who knows me also knows this is rare for me to do but I’m proud of this one. So…last May or June I was going through some folders of historic Westport info that I’ve collected over the years and I came across an article I’d cut out of the newspaper about 25 years ago describing the history of Longshore. As I re-read it, I noticed that Longshore was purchased in 1960 and realized that 2010 would mark the 50th anniversary of this purchase. Because I was on Westport’s Parks & Recreation Commission (in my 8th year), I mentioned this discovery at our next meeting and suggested that we discuss some sort of event to commemorate this landmark purchase. The Commission agreed that it was worthy of further discussion and so we decided to put the topic on our agenda for the Fall. But, before the agenda item came up again, the idea took off (without any additional effort on my part) as a few great people from the Golf Advisory Committee latched onto it and began breathing life into it. Kudos to Scott Smith who is chairing the new Longshore Anniversary Committee. (P.S. – I was also so glad to see you on the Committee too). Some folks might wonder why I’m not on the Anniversary Committee if this whole thing got started by my bright idea. Well, I cycled off the Parks & Rec. Committee in December due to its 8-year term limit. As much as I loved the idea of the Longshore celebration, I had to talk myself out of joining the Longshore Anniversary Committee because I needed to focus on some long-neglected personal projects that I’d deferred for too long due to my commitments to the many town commissions or committees I’ve served on for the last ten years. I simply needed a break, including a break from one of my own decent ideas. However, I want to wish good luck to all of the great people, including you, who have now offered up their volunteer time to move this event forward. The project is in some great hands and I have complete confidence it will be even more terrific than I originally envisioned. Though I’m too pooped to be a player in this one, I’ll continue to be a fan as I watch and cheer from the sidelines. Great back story, Wendy. THANKS for sharing it. I know we will be coming to you often for help, ideas, encouragement and general Wendy-ness. We look forward to having you on board (whether you want to be or not). It’s your baby! It will be a huge shame if golf, the most popular activity serving the most people at Longshore since the day the Town purchased the property doesn’t get its proper due in this celebration. Not to worry. Golf is definitely a key component of the celebration. And Scott Smith — the chairman of the 50th celebration committee — is a golf guy through and through. I can’t understand why no one is giving Julian Brodie any credit for using his talents to convince the Westport public to buy the property. After all, the entrance road is named after Julian, an old fellow commuter friend. I learned to play golf at Longshore in the 40s when it was private and when George Buck got the top tour players for pro-ams. I was lucky enough to play with the Manero and Catropa brothers as well the immortal Tommy Armour.